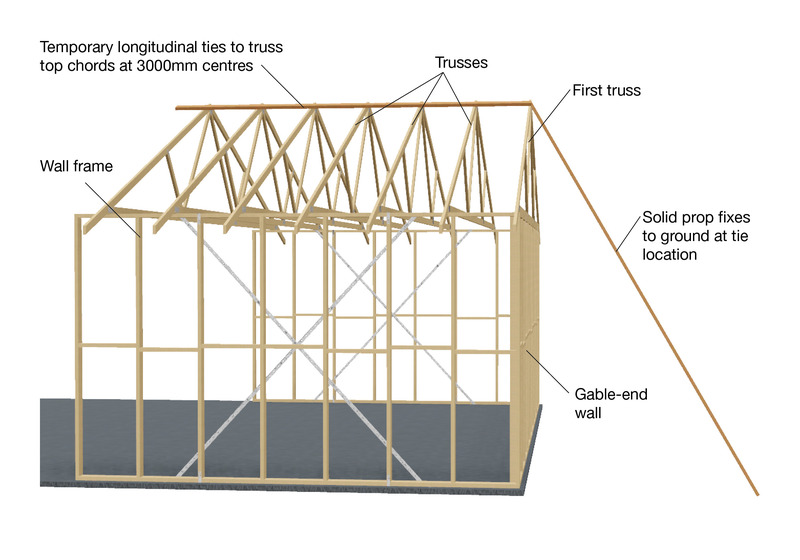 This provides temporary bracing details recommended for gable, hip and dutch-hip end roof trusses. The first truss should be erected correctly, straight and vertical, and temporarily braced in position. Each successive truss should then be spaced correctly and fixed back to the first truss with temporary ties to top chord at a maximum spacing of 3000mm and to bottom chord at a maximum spacing of 4000mm. Ties should be fixed to each truss with a minimum of one 75mm x 3.05Ø nail. Temporary ties are not designed to be a trafficable platform. Steelbrace is not acceptable for temporary bracing. Temporary bracing for a hip or dutch-hip is achieved by erecting and fixing the truncated girder, or dutch-hip girder truss, in the correct position to the top plates and bracing the girder truss back to the corner of the building as shown in Figure below. Ensure no weight or load is placed on the truss overhangs, especially in the vicinity of the hip overhang, until all necessary structural members, such as structural fascias and roof battens, have been fully installed. 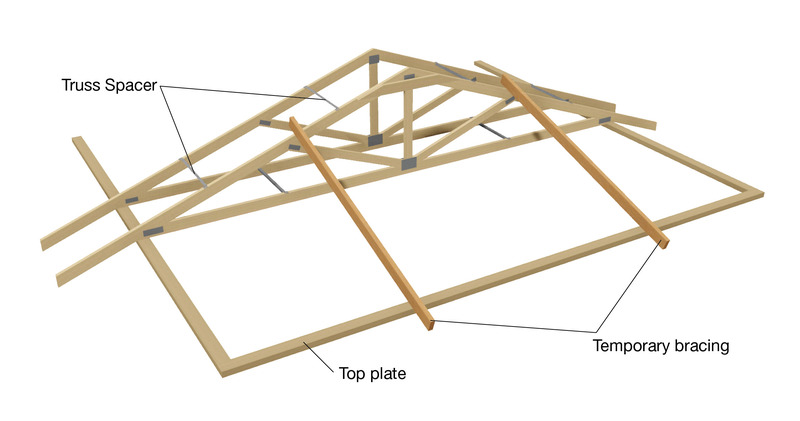 Temporary bracing for a gable-end roof is achieved by erecting and fixing the first truss to top plates at one end of the roof and bracing the truss to a rigid element; eg, the ground, as shown in Figure below.